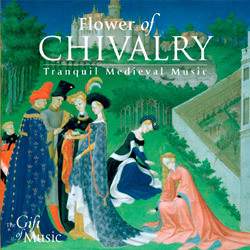 The Flower of Chivalry features peaceful and calm medieval music. Performed by The Hilliard Ensemble, this selection includes gentle songs by one of the greatest composers of the middle ages, Guillaume Dufay, whose music was often heard at the Burgundian court in the 15th century. The collection is completed with harp music composed by King Henry VIII, and songs by Martin Codax of Spain..